The Indie Meme Film Festival (IMFF) joins the Austin community for the fourth year in a row. Over a period of four days, the festival will showcase carefully curated, critically acclaimed, socially relevant bold & inspiring features, documentaries, and shorts from South Asia. The kick off event on April 14th includes the family film Chuskit which is the story of a feisty paraplegic girl who locks horns with her tra­dition-bound grandfather – to chase her dream of going to school! The Centerpiece, Her. Him. The Other (Sri Lanka/Fiction/Drama/1hr56min/Sinhala & Tamil), is from Three Sri Lankan filmmakers renowned for their internationally acclaimed films based on the Sri Lankan civil war, join in to make one film to express their views on post-war reality. The Closing night film is, Kaamyaab (India/Fiction/Comedy-Drama/1hr 53min/Hindi). On being made to go through his own IMDB page, Sudheer, a washed up side actor from the heydays of Bollywood, realizes that he ‘retired’ on the verge of a rare milestone – he had featured in 499 Hindi films! Now at 63, against the wishes of his daughter, he decides to come out of retirement to complete the round figure of 500 and get that one substantial role for which he will be remembered forever. Mangesh Desai, The Sound Man, (India/Documentary/1hr53min/Hindi) is featured amongst top 10 sound mixing engineers of the world by New York Times, Mangesh Desai was a genius and regarded so by the Indian film community. With unparalleled understanding of the craft & technique of sound, Desai’s dynamic range of work goes from the artistic extremes of Satyajit Ray and Shyam Benegal’s art films to the blockbusters by the likes of Manmohan Desai, Vidhu Vinod Chopra, Gulshan Rai, Yash Chopra with films including Deewar, Kabhi Kabhi, Sholay – the list goes on! A true tribute to a true hero. 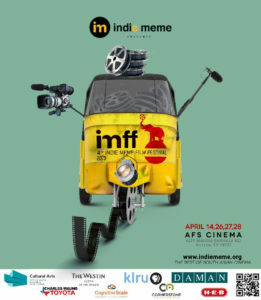 A 501c(3) non-profit, Indie Meme’s mission is to promote socially relevant independent cinema from South Asia, in an effort to influence social and cultural awareness and consciousness, and encourage and facilitate dialogue. Indie Meme engages, educates, entertains, and brings together different communities to promote cross-cultural understanding and build a globally conscious community.